Forming in the early months of 2014 from a mutual love of thrashing guitars around and just being general nuisances, the four lads from Mary Handsome have set out to create tunes that have equal parts catchiness and attitude. Mary Handsome welcomed in the New Year with shows at some of Brisbane’s most renowned venues such as The Zoo, The Triffid and Ric’s Bar. 2015 also saw them travel to the Northern Territory for a string of shows where they surprised audiences with their blend of twangy duel-guitar riffs and surfy undertones. After returning back from the dusty roads of Northern Australia the band quickly went to work on their debut EP. 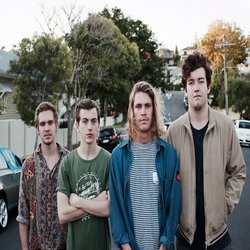 6 months on and the boys are releasing new single ‘No Hot No More’, backing it up with shows in Northern Australia and heading down the East Coast. They are scheduled to play the Yirrkala Morning Star Festival with East Journey and The Medics, held in a remote Indigenous community on the coast of North East Arnhem Land. Then venturing down for shows in Byron Bay, Melbourne and Sydney.